Designed to make following LCHF (Low Calorie, Healthy Fat) lifestyle simple. Enjoyable and nourishing, What the Fat? 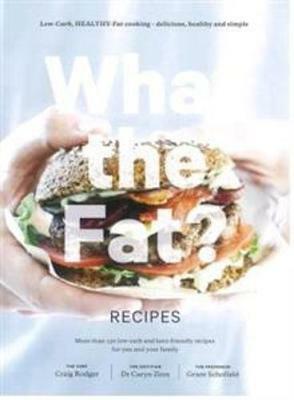 Recipes brings together the authors' go-to easy, delicious and nutritious LCHF recipes. Embracing unique cultural flavours from across the globe and tried-and-trus... read full description below. Designed to make following LCHF (Low Calorie, Healthy Fat) lifestyle simple. Enjoyable and nourishing, What the Fat? Recipes brings together the authors' go-to easy, delicious and nutritious LCHF recipes. Embracing unique cultural flavours from across the globe and tried-and-trusted household staples, this comprehensive collection of over 130 recipes has all your LCHF meals covered. Broken into breakfasts, lunches, dinners, snacks, sweets and drinks-and even children's party treats, each recipe includes per serve nutritional information for carbs, protein, fat and energy as well as dietary guidelines for dairy-free, sugar free and vegetarian options. You won't believe how easy and tasty it is to live a LCHF lifestyle!